Will Tax Reform Be Good For the Economy? By clicking through to the story, you agree to a short but painful lesson in economics and a surprise answer to the question! A huge thanks to our wealth management CPA partner, Dustin Nelson for his helpful presentation on the current tax reform act at our full house Solution Series event last Thursday. Dustin provided the current plans as they stand from both the House and Senate as well as tried to distill a lot of unknown tax law in high probability action items. It was a huge task but he handled it well. The presentation slides can be viewed HERE if you are willing to spend the time…I’d say it is worth your time. I don’t want to get into the weeds of the tax reform act itself given all the unknowns but there is a clear orientation to where the changes are directed so I’d like to speak to that. Specifically, tax reform is being sold to the American public as a good thing for our economy, for jobs, for income, etc. Now prepare for an economics lesson. I actually had to dig up my old macro econ textbooks to clarify this in my mind. Let’s start with the basic assertion that tax cuts should stimulate economic growth or the growth in our Gross Domestic Product (GDP). GDP is effectively a measure of our country’s Output as the summation (combined sum) of Labor (L) and Capital (K). Now for the brain damage. K is used as a symbol for a very specific type of capital. It stands for investments in research and development, job training, infrastructure, facilities, and things like robotics and automation hardware. By this measure, our investment in K, as a country just hit an 11 year low. We have not largely invested in K in years for quite a few reasons, which I won’t go into now. Instead, companies are choosing to sit on great gobs of cash and the Velocity of Money is also sitting at all-time lows. Trillions of dollars’ worth of cash is sitting idle in our country today. The key point to remember is that we need to see growth in K in order to see a meaningful change in Output (or GDP). The only type of Capital that matters with regards to real economic growth is the K type. The growth of Labor (L) = growth of the Labor pool itself + Labor productivity. The most recent stats I have seen suggest that the labor pool is only growing by a value of 0.70% and labor productivity is pegged at a value of 1.2%. combining these with simple math we see that the Growth of Labor = roughly 1.9%. These are both very low numbers and a function of retiring baby boomers, a relatively large number of potential labor that have fallen out of the workforce and relatively low worker productivity. Now, back to our original equation. Let’s plug in the value of L.
Now for more than a decade, our Output as a country (GDP) has been stuck at a growth rate of 2%. That stands to reason since K is basically 0 and our Labor contribution is 1.9%. To be fair, the last two quarters of GDP have come in right at 3% so maybe we’re starting to see a little pickup K? We can only hope. Let’s bring it back to the question of whether or not the current tax reform act will stimulate economic growth. Spoiler alert – It will not. Because, the entire essence of all the changes in the tax reform act are not oriented toward increases in K, which we desperately need, but little c. Cutting corporate taxes from 35% to 20% will increase profits and cash. There will be some benefit to select groups who might see some increase in their net take-home pay at the end of a year. This again is cash. Cash might be spent giving a little pump to consumption and earnings but again, we’re still talking about little c, not BIG K.
Summary statement; If the Tax reform act goes into place, we are only likely to see a modest pump to stock prices with little to no change in actual economic activity or growth. The question I am wrestling with now is how much of this benefit has already been pulled forward into the gains we have already seen in 2017. Some for sure. Let me wrap this up with a final bit of news. There is a provision in the new tax code that offers some incentives for companies to invest in K in the form of expensing and accelerated depreciation. That again is good for the company bottom line as they can say build a factory and expense most of it in the first year cutting their net income and their tax burden. Again, good for little c and maybe good for K. It really depends on how many companies are ready to invest in K. So far, almost none. But here’s some sad truth. Companies today are making investments in automation and robotics that are essentially replacing workers. This is happening across multiple industries at an alarming rate. Workers are being replaced by software as a service, automation, efficiency to the degree that we have an entire middle class wondering what just happened to their careers? Here’s a graphic example. You can figure out what happened here right? Employees in Oil and Gas drilling are being replaced with automation as rigs are coming back online since mid-2016. 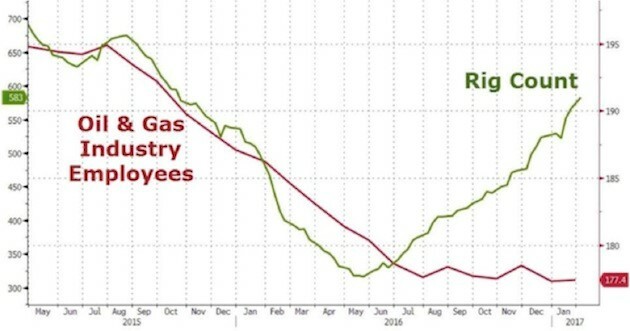 So, the next time someone tells you that renewable energy is hurting American workers in Oil and Gas, you can correct them. The Oil and Gas industry is hurting American workers in the Oil and Gas industry all by itself. The new form of investment in K, as it’s happening now, is, unfortunately, a huge unemployer by way of investments in automation and robotics replacing people. If we think about the equation for economic growth, you begin to see the big picture. If K goes up (increases in investment in automation and efficiency technology), then necessarily, some portion of Labor (L) will likely fall. In other words, for any increase in K, we could easily see an increase in unemployment. We’re obviously a bit stuck. All in, tax reform is highly unlikely to turn the needle of our country’s economic growth beyond a little wealth effect from a rising stock market. But then again, stocks only rise sustainably when economic growth is rising. I’m hoping this helps make sense of what’s really happening with the current tax reform act as it stands today. It’s all about pumping the stock market so you-know-who can get a little credit. Will someone please forward this to the White House?